In connection with the exhibition ”Os Dem Demos” [Us Them Demos] Walking Distance is arranging 3 walks inspired by the anti-terror packages and their relation to the judicial, the legislative and the executive powers. We shall confront the anti-terror packages and the authorities by placing ourselves in public spaces – visible, vulnerable and questioning. We wish to raise questions about the consequences that the legislation involves for our freedom of action and our legal rights as citizens and artists. Meeting-point: In front of Christiansborg Palace Chapel. On the first “The architecture of anti-terror” tour, which took place by bus, we looked at the administrative authorities involved in carrying out the anti-terror legislation. These include the Danish Immigration Service, the Danish Security and Intelligence Service and other authorities charged with implementing the anti-terror packages. About 50 people participated in the tour. Architect Merete Ahnfeldt-Mollerup was the guide together with Nis Rømer. Christiansborg was the starting-point for the bus tour. In reaction to 9/11 a majority in the Folketing enacted the anti-terror package in 2002 and later adopted a number of additional provisions in 2006. The anti-terror packages gave expanded powers to the Danish Security and Intelligence Service and the Police in particular, but at the same time it also introduced limitations in the individual citizen’s civil rights. Architectonically Christiansborg was already outdated when it was built. Rather than expressing the democratic ideas of the day, the architecture reflects the institution of absolute monarchy that the introduction of democracy was designed to break with. The Supreme Court. It is remarkable that here the threefold division between the legislative, the judicial and the executive powers is cancelled out by the architecture. The home of the Supreme Court is physically attached to Christiansborg. In Denmark there is no other kind of constitutional court, which means that the judiciary has only limited possibilities of controlling laws and the legislators and ensuring the citizens their rights. 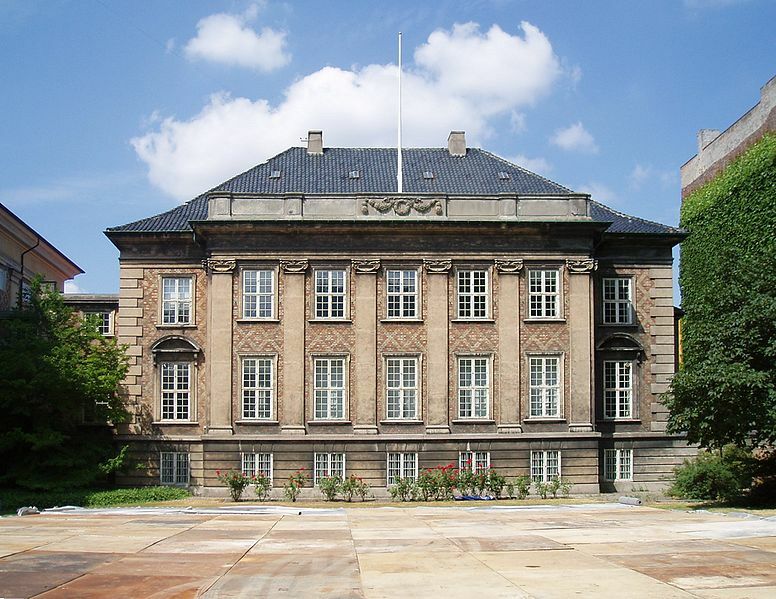 The High Court of Eastern Denmark was originally built as an opera house and rebuilt as a court in 1919. Here Fighters+Lovers were given a prison sentence of 6 months for supporting FARC and PLFP. The case has now been appealed to the Supreme Court. Kastellet, the Copenhagen Citadel, is the home of the Danish Defence Intelligence Service. Section 17.1.1 of the Defence Act states: ”In wartime or under other special circumstances the Defence Minister may without a court order introduce measures concerning Section 72 of the Constitution in regard of telephone conversations, mail and other forms of communication.” In other words, the Defence Act permits the Defence Minister ”in wartime or under other special circumstances” to initiate surveillance and phone-tapping of Danish citizens. The terror fence in Nordhavn was erected in consequence of the new threat picture that emerged after 9/11. The fence extends endlessly and closes off almost the entire area from public access. The terror assessments on which it is based are secret and therefore cannot be publicly challenged. The USA embassy is one of the places where anti-terror measures have been given their most direct architectonic expression. At what was originally a site that sought to promote openness and freedom, there are now massive anti-terror flower tubs, a fence and cameras. Ugly but secure, as a major German paper wrote of the new American embassy in Berlin. After a corruption scandal the Refugee Agency was rechristened with the use of Orwellian Newspeak as the Danish Immigration Service. Together with this Service the Danish Security and Intelligence Service can without recourse to the courts reject applicants that they suspect of terror. Architectonically one is struck by the reflecting glass together with the surveillance cameras on the facade. It is said that the walls are so white because of the graffiti and the repeated repainting this has necessitated. Historically this was once one of the poorest districts in Copenhagen. The area around Glasvej is characterised by potholed asphalt and buildings of only modest quality. The so-called Glasvej Case resulted in sentences for planning terror of 7 and 12 years respectively at Glostrup Court in October 2008. The case has been appealed to the High Court of Eastern Denmark. The normalisation of terror and anti-terror can be seen reflected in the architecture. The Danish Security and Intelligence Service is situated in a district with one-family houses. Its HQ could be mistaken for the main office of a computer firm. Mediocre mainstream architecture, perhaps with a slightly higher frequency of window blinds. We served rolled spicy meat and aquavit in the visitors’ parking lot. Later the police turned up in strength and registered all the participants in the lunch even though nothing illegal was taking place. The Copenhagen Police Headquarters was the last stop on the tour. The building was designed in neoclassical style by the architect Hack Kampmanm, Aage Rafn and others – a fine example of the architecture of power that doesn’t pretend to be anything but what it is.